Woody Harrelson, marijuana advocate and actor, has tried and failed to gain a permit that would allow him to open his own marijuana dispensary in Hawaii. He was one of 66 residents to apply for a permit in January of this year. Born on July 23, 1961, in Midland, Texas, Harrelson is perhaps best known for his eponymous bartender character in the much-loved sitcom Cheers or, more recently, for his stint in the HBO drama True Detective. Yet this two-time Academy Award-nominated actor is also a huge advocate for recreational marijuana use in the United States. That is precisely why the actor wanted to open up a Woody Harrelson marijuana clinic. Ever the environmentalist, in 1996, he was arrested for scaling the Golden Gate Bridge in San Francisco in protest of the planned logging of 1,000-year-old redwoods in California. That same year, he was also arrested for symbolically planting four hemp seeds in Lee County, Kentucky to challenge a state law, which did not distinguish between industrial hemp and marijuana. It was this second act of activism that brought his relationship with hemp into sharp focus. And, although at first he was keen to focus on industrial hemp as an alternative fiber source for paper and building materials, it didn’t take long for Woody to become synonymous with the marijuana legalization movement too. In 2001, while speaking at the Seattle Hempfest, he proudly told the crowd that he was an active pot smoker. Two years from then, he was the keynote speaker at a conference for the National Organization for the Reform of Marijuana Laws, an organization that he has remained part of ever since, sitting on the advisory board with some other notable names, including Willie Nelson and Bill Maher. A hugely versatile actor, Harrelson has appeared in countless popular and renowned films such as Natural Born Killers, White Men Can’t Jump, Zombieland, The Hunger Games, and Seven Psychopaths. And, for Woody Harrelson, marijuana has even cropped up in his film career. He narrated Ron Mann’s weed documentary Grass (1999) and appeared in another documentary by the same director called Go Further (2003), which gave insight into Harrelson’s dedicated lifestyle of raw foods, biofuels, yoga, and hemp. Five years later, he co-starred with fellow marijuana enthusiasts Matthew McConaughey and Willie Nelson in the stoner comedy Surfer, Dude (2008) before popping up in another documentary called Hempsters: Plant the Seed (2012). So, with all this in mind, it really wasn’t too much of a surprise when the actor threw his hat into the ring for a permit to open a Woody Harrelson marijuana dispensary in his adopted home of Hawaii. The state of Hawaii became the first to legalize medical marijuana through the legislative process over 16 years ago. And, thanks to a law passed in 2015, the state was able to grant eight dispensary licenses. Woody Harrelson’s LLC Simple Organic Living was one of 66 groups that applied for a permit to open a retail store dispensing marijuana products. However, a four-member state committee put the kibosh on Harrelson’s plans by overlooking his company when the time came to hand out the available permits. The state said it had based its decision on the amount of points each applicant had scored during the review process; those scores are set to be made public in the next two weeks. So for now, it’s a mystery as to why the Woody Harrelson marijuana dispensary didn’t become a reality. Harrelson wasn’t the only noteworthy name to miss out on one of those sought-after permits. Henk Rogers, the inventor of Tetris, had also applied and was disappointed not to be among the likes of Aloha Green Holdings Inc. and Manoa Botanicals in successfully receiving the thumbs up from the state. A total of 16 dispensaries will be opened in Hawaii: six on Oahu, four on Hawaii island, four on Maui, and two on Kauai. The successful applicants had to have a cool $1 million in cash available plus an additional $100,000 per dispensary location. They also had to be ready to pay the $75,000 licensing fee to the Department of Health within seven days of receiving written notice of their selection. Well, for now, we don’t know. 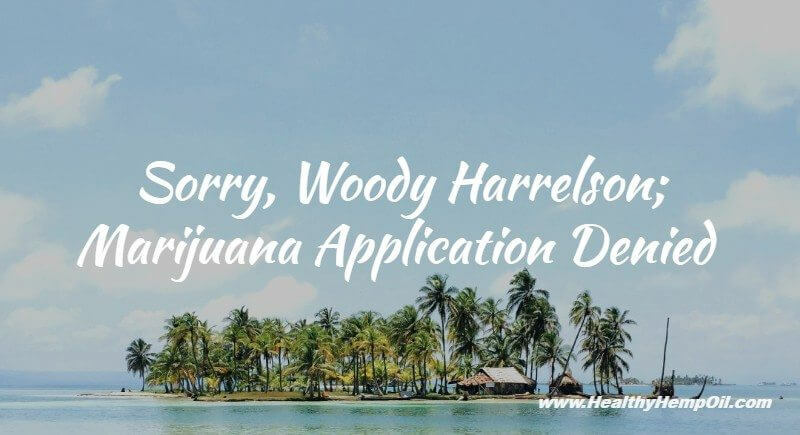 His spokesman has declined to comment on the decision, and until the state releases the scores that informed their decision, we won’t know where the Woody Harrelson marijuana dispensary venture fell down. However, as a longtime supporter of marijuana legalization and an occasional resident of Maui, it wouldn’t be a surprise to see Harrelson apply again should Hawaii’s Department of Health elect to grant additional licenses in the future. He’s also not the first celebrity to dip his toe in the world of marijuana. Celebrity potrepreneurs such as Whoopi Goldberg, Snoop Dogg, and the estate of Bob Marley have all given their backing to various cannabis-related products. Who knows? If we don’t have a Woody Harrelson marijuana dispensary opening in Hawaii in the near future, we may yet see the Hunger Games star lending his likeness and endorsement to his own line of marijuana products. Marijuana’s about marijuana. That’s consensual, victimless crime. That’s saying, I think I should have the freedom to do whatever the hell I want to do if I’m living in a so-called free country, as long as I’m not hurting someone else. That’s freedom. If I’m gonna hit myself in the head with a hammer, so be it. That’s freedom. And while the drug remains banned under federal law, you can be certain that Woody Harrelson will continue to campaign and speak out in favor of both medicinal and recreational marijuana. He is, after all, free to do so. What do you think of Woody’s attempt to open a medical marijuana dispensary? Will other celebrities attempt to follow suit? Will Hawaii’s Department of Health regret not issuing Woody with a permit? Tell us your thoughts in the comments. This entry was posted in CBD News and tagged Hawaii.